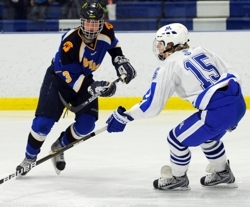 Minnetonka, a team loaded with high-end forwards, has rocketed all the way to No. 3 in this week’s state rankings on the strength of, all things, its defense. The Skippers’ junior-dominated defensive corps didn’t get much varsity experience last season, the result of playing behind a senior-laden group that included three players committed to Division I schools before last season began. Helping speed along the maturation process for defensemen Jack Teal, Michael Prochno, Steve Johnson and Joe Schuldt, among others, has been the down-low diligence of Skippers centers Thomas Schutt, Sam Rothstein and Connor Ryan. “Our centers are very good down low … they help the young kids out,” Minnetonka coach Brian Urick said. The Skippers were nearly flawless defensively in their 6-0 triumph over Wayzata on Saturday, Jan. 29. While goaltender Alex Glockner was tested often, most of the Trojans’ best scoring chances came during their power-play opportunities. “We didn’t get caught with any odd-man rushes, we didn’t turn it over much in the neutral zone and we always had a third guy back,” Urick said. Schutt, in particular, has been a defensive standout. The senior typically draws the toughest assignments, being asked to shut down Lake Conference stars such as Eden Prairie’s Kyle Rau, Wayata’s Tony Cameranesi and Edina’s Steven Fogarty. 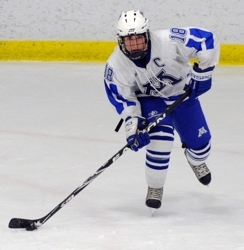 “He’s something else,” Minnetonka junior forward Erik Baskin said about Schutt. “He is such a good leader. It’s so easy to take after him, what he does out there. Minnetonka is joined by No. 5 Maple Grove and No. 7 Burnsville to form three of the state’s hottest big-school teams. In Class 1A, St. Thomas Academy and Hermantown are still No. 1 and 2, respectively with Blake the runaway choice at No. 3. Hottest team in the state? The Pioneers have won seven straight and have lost just once in their last 15 games. Latest reshuffling of forward lines has unlocked some high-scoring combinations, led by the unit of Ben Bahe, Bobby Bruski and Jake Guentzel. Senior standout Tim Shaughnessy gives Pioneers a goaltender with plenty of big-game experience. The Eagles seem to have fully recovered from a January lull in which they went 0-2-1. Eden Prairie went 3-0-0 last week, outscoring their opponents 25-9. Continued emergence of Luc Gerdes and David Rath as goal-scoring forces (they each have 18) takes pressure off Eagles' scoring leader Kyle Rau (21 goals, 27 assists). Stunning 6-0 triumph over Wayzata on Saturday puts the Skippers in first place in the talent-laden Lake Conference -- for now. Minnetonka is getting elite-level goaltending from senior Alex Glockner, clutch scoring from junior Erik Baskin (six goals in his last three games) and continued improvement from a young defensive corps that includes juniors Michael Prochno, Jack Teal, Joe Schuldt and Steve Johnson. The Red Knights have won five straight and nine of their last 10. They haven't faced a top 10 (Class 2A) team since losing 5-4 to Edina on Jan. 11, but 9-2 blowout of Totino-Grace (ranked No. 4 in Class 1A) qualifies as a quality win. Senior Pat Steinhauser (15 goals, 25 assists) has been held without a point just once this season. The Crimson are coming of a huge week in which they beat Northwest Suburban Conference rival Blaine 4-2 before heading north and knocking off No. 6-ranked Duluth East 3-1. Those victories extended Maple Grove's win streak to nine. Dylan Steman and Tyler Dunagan, with 10 goals apeice, lead balanced offense. All four of the Greyhounds' losses have come to teams that have been ranked in the top 10 this season, including the most recent setback to No. 5 Maple Grove. Six-game stretch to end the season includes four home games and does not feature a top 10-ranked opponent. The Blaze are unbeaten in their last seven games and have allowed just one goal in their of their last four. Mike Dockry, with 24 goals, is one of five Burnsville players in double digits in scoring. Senior goaltender Bodhi Engum has a .900 or higher save percentage in each of his last four games. After starting the season with a 10-game win streak, the Trojans are winless in their last three games and 3-4-2 in their last nine. They have allowed four or more goals in four of their last five games. Senior Tony Cameranesi, a Minnesota-Duluth recruit, has team-best 41 points (14 goals, 27 assists). After a three-game losing skid, what better way to get on track than winning two games (over Hopkins and Totino-Grace) by a combined score of 15-1. Tough challenges - and potentially more losses - are on the horizon, however, as four of Hornets' last six games are against fellow Lake Conference heavyweights (Eden Prairie twice, Wayzata and Minnetonka). A top 10 "bubble" team, Eagan cranked up the offense -- and ratcheted down the defense -- last week in suprisingly lopsided 10-0 rout of Lakeville South. The Wildcats, third behind Burnsville and Bloomington Jefferson in the South Suburban Conference standings, are on the road Saturday for a showdown with ever-dangerous Apple Valley. Honorable mention: Apple Valley, Moorhead, Grand Rapids. After twice taking No. 3 (Class 2A) Minnetonka to overtime before losing, the Cadets gave another big-school powerhouse, No. 1 Hill-Murray, all it could handle before losing 4-3. Sophomore David Zevnick was brilliant in that loss to the Pioneers, giving St. Thomas Academy the type of goaltending performance it will need in the playoffs. Hermantown, the state's only one-loss team, travels south on Tuesday for a classic small school vs. big school, north vs. south matchup against Eden Prairie. One-two offensive combination of Garrett Skrbich (26 goals) and Jared Thomas (19 goals) among the state's best. After beating Breck 4-2 in emotional rivalry showdown last Thursday, the Bears needed a third-period goal by Johnny Austin to get past St. Paul Johnson 3-2 on Saturday. George Ordway (17 goals) and Donald Chute (16 goals) are dangerous scoring duo. The Eagles have struggled against top-ranked big school opponents (Benilde-St. Margaret's and Edina) but only other loss came against No. 3 Blake. Another major test aways on Tuesday with road game at No. 1 St. Thomas Academy. T.J. Roo, Danny Heck, Xavier Fust and Derek Lodermeier each have scored 13 or more goals. The Mustangs have won just one of their last four games, and last Saturday's 13-3 win over the St. Paul Saints halted second three-game losing streak of the season. Goaltending situation is unsettled with three Mustangs Breck goaltenders having played at least four games. Weekend road trip up-north and to the west resulted in impressive victories over Warroad and Thief River Falls that rocketed the Hilltoppers back into the top 10. Junior goaltender Christian Coffman has allowed just three goals in his last three games, all of them against high-quality opponents -- Cloquet, Warroad and Thief River Falls. After a 10-day layoff, the Bluejackets are on the road on Monday, Jan. 31, for a matchup with Proctor. Hibbing has lost three of its last four but boasts one of the state's most prolific offenses, led by the duo of Nick DeCenzo and Adam Johnson, each of whom have 58 points. The Prowlers have hardly been a picture of consistency, but then again no team in Section 8A has separated itself from the pack. Micah Ranum has team-best 18 goals -- no other Prowler has more than nine. Josh Koop has handled the bulk of the goaltending minutes and has posted respectable numbers 2.41 goals-against average, .891 save percentage). The defensively stingy Eagles have allowed a combined seven goals in their last five games, all of them victories. Rochester Lourdes has just one loss to Minnesota competition (Duluth Marshall) with the other coming to Eau Claire Memorial, Wisconsin's No. 1-ranked team, in a holday tournament in Rochester. Senior forward and St. Cloud State recruit Garrett Hendrickson has had six-point performances in two of the Blue Devils' last four games that has helped him climb to third on the state scoring list with 63 points (26 goals, 37 assists). Goals will be more difficult to rack up during closing stretch of season that includes upcoming games against Iron Range Conference rivals Grand Rapids and Hibbing. Honorable mention: Warroad, South St. Paul, Little Falls, St. Cloud Cathedral.